I rise to milky sunshine spilling around my silver Venetian blinds. The hotel is called Zoo after the nearby attraction so I go directly there and buy a ticket at the gates. 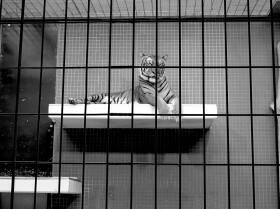 Wild animals caged and corralled right in the city’s heart. First up are a small group of Indian elephants, forlornly trying to get back inside their locked sleeping enclosure. Their trunks are fascinating and surprisingly dexterous. It’s a quiet day here, just a smattering of humans, mostly pushing prams and wheelchairs. I skirt around the giraffes paying them barely a glance and am drawn towards a lonely young panda who is endlessly shuttling between its shuttered hovel and some frustratingly fenced-off eucalyptus. It seems deranged but what do I know? Other visitors are captivated by its cuteness. If it was mine I’d have it put down. The whole place is a morass of desperation. Grubby hooded vultures and a completely disorientated bald eagle eye each other dismally through their wire barrier, mountain goats like mad tramps crush themselves into their concrete crags to hide from the relentless gaze of passers-by. I cut through the cat house; it gets worse. The tigers look at you with open hatred, sated by prison food but hungry for a kill. The jaguars are in meltdown and seem lobotomised. The female cries pathetically for privacy at her toilet hole by the front of their cage. A single proud leopard regards them with pity from its high shelf. I duck down into the nocturnal cellar, an altogether cheerier environment. There is some amusement here; crazy little giant-eared fennec foxes skip about in their Hollywood desert like chihuahuas on cocaine. The slow loris is superb: athletic and graceful as it traverses its twisted branches at quarter-speed. There are short-nosed rat kangaroos in the next enclosure, springing around like armless nutters in a witty contrast. I like the aardvark too; a living cartoon with its long snout, big behind and flappy ears. I know its all projection. These creatures are just staying alive and have the luxury of the absence of predators. There are worse ways to exist than having guaranteed access to life’s necessary resources in return for being enslaved for entertainment, constantly photographed and pointed at. Just ask a celebrity. I horse east through the Tiergarten, essentially Berlin’s Central park. Norman Foster’s Reichstag dome is the first sight of city I see after forty minutes hard walking. I try to get a handle on the area around the Brandenburg but I just encounter a new-build Oxford Street. I didn’t come here for a souvenir. I head south where I manage to find a proper coffee shop. I read about the previous day’s riot in London. Then I read about football teams winning and drawing and losing. The sun spreads its palms across the square outside. Everybody all around in their natural habitat; perfectly evolved to carry briefcases, push strollers, drink coffee, handle money. This is one of my favs of your travelogues. Zoos are such sad places. 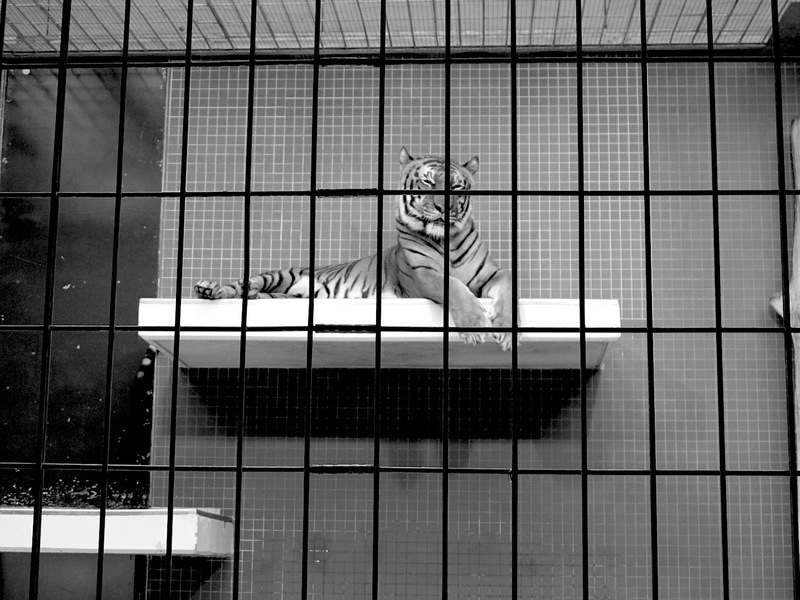 How are caged animals in misery “entertainment”? Heinous humans.